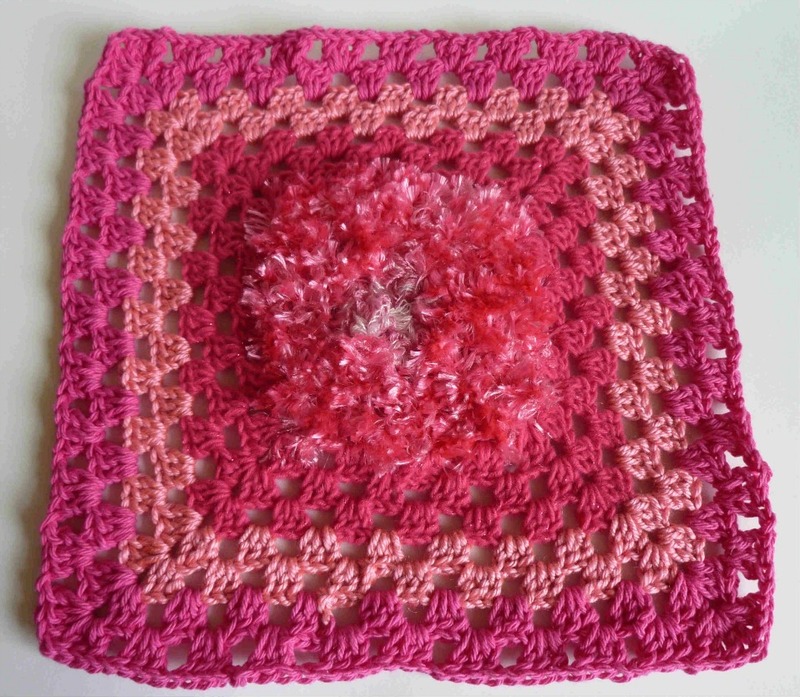 I have been wanting to do a Crochet-A-Long for a while now, but when I was looking at other CALs I discovered something wonderful. Most of the CALs I looked at were just multi-post tutorials. Hey, we've already done that! Several times! So, having a big CAL lost some of it's shiny fun excitement. On the other hand, I do love having giant multi-post projects, so I'm going to go ahead and spend the week on this project. I spent a lot of time trying to decide what we could do that really NEEDED more than one or two dedicated posts. I knew that I wanted to do something to celebrate Breast Cancer Awareness Month, and I wanted to make something special to celebrate my grandma's struggle with breast cancer this year. Think Pink! Finished blanket measures 41" square. Now that I've scared off pretty much everyone, let's get to the fun stuff! My Think Pink blanket (can I just call it a blanket? It's a small blanket.) is made up of 9 squares. We're going to work on the first 5 squares today (I'll end the post with a preview of the 4 squares we're going to do on Tuesday and Wednesday). These are easy 11-row granny squares, so have fun with them. Each one should be different. 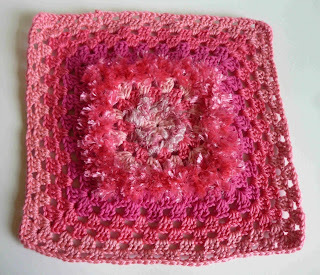 When I bought the yarn for this project, I picked a wide variety of worsted weight (size 4) pinks. 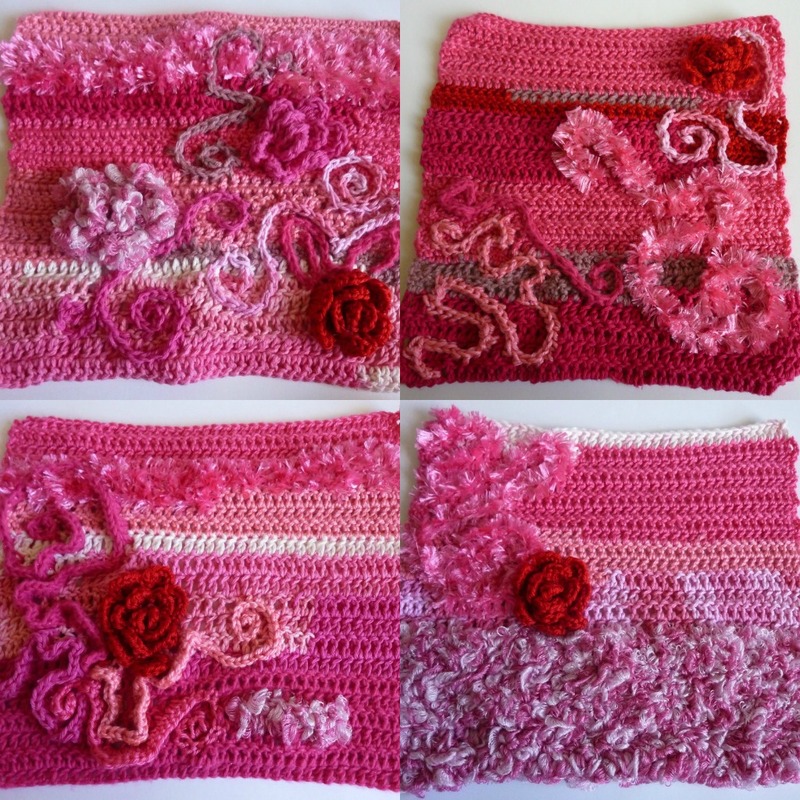 I picked pink acrylic yarn, pink cotton yarn, pink eyelash yarn, pink ribbon yarn and pink wool-blend yarn. I even got some pink sparkle yarn. I looked for lots of different shades and textures, so that there would be lots of contrast between the colors to create more visual interest. (Basically, the more shades and textures you use, the better this thing looks, and the more fun you have coming up with cool combinations of yarn in your squares.) No, you don't have to use 10, or more, different yarns to make this project, but it will look better if you do. If you are a compulsive yarn-stash type of person, go raid your stash first before you head to the store, okay? This is the PERFECT project if you've got weird lengths of yarn left over from something else. You can use as little as a single yard in this project. Stick to pinks, although I added a little red to the mix which added a pop of interest that I couldn't have gotten with an all-pink-palette. I used a variety of yarns, and switched colors on my whims. Don't do more than 4 rows in a single color. Eyelash, boa and ribbon yarns are fun for this, but may throw your gauge off a little. If it's only one or two rows, don't worry about it. If you do a whole square in fun textured yarns though, just make sure the square is 12". The size is more important than the row count. R1: ch 3 (counts as dc), 2 dc, *ch 1, 3 dc* three times, ch 1, sl st to 3rd chain from beginning of the row to close round. R2: work 2 sl stitches so that your hook is next to the next chain space, (3 ch, 2 dc, ch 1 to form a corner, 3 dc, ch 1) in chain space, [*3 dc, ch 1 to form a corner, 3 dc, ch 1* in next chain space] three times, sl st to 3rd ch from the beginning of the row to close round. R3: work 2 sl stitches so that your hook is next to the next chain space, [3 ch (counts as dc), 2 dc, ch 1] in chain space, [(3 dc, ch 1 to form a corner, 3 dc, ch 1) in next chain space, (3 dc, ch 1) in next ch space] three times, (3 dc, ch 1 to form a corner, 3 dc, ch 1) in next ch space, sl st to 3rd ch from the beginning of the row to close round. R4: work 2 sl stitches so that your hook is next to the next chain space, [3 ch (counts as dc), 2 dc, ch 1] in chain space, (3 ch, ch 1) in next chain space, [(3 dc, ch 1 to form a corner, 3 dc, ch 1) in next chain space, (3 dc, ch 1) in next ch space, (3 dc, ch 1) in next ch space] three times, (3 dc, ch 1 to form a corner, 3 dc, ch 1) in next ch space, sl st to 3rd ch from the beginning of the row to close round. 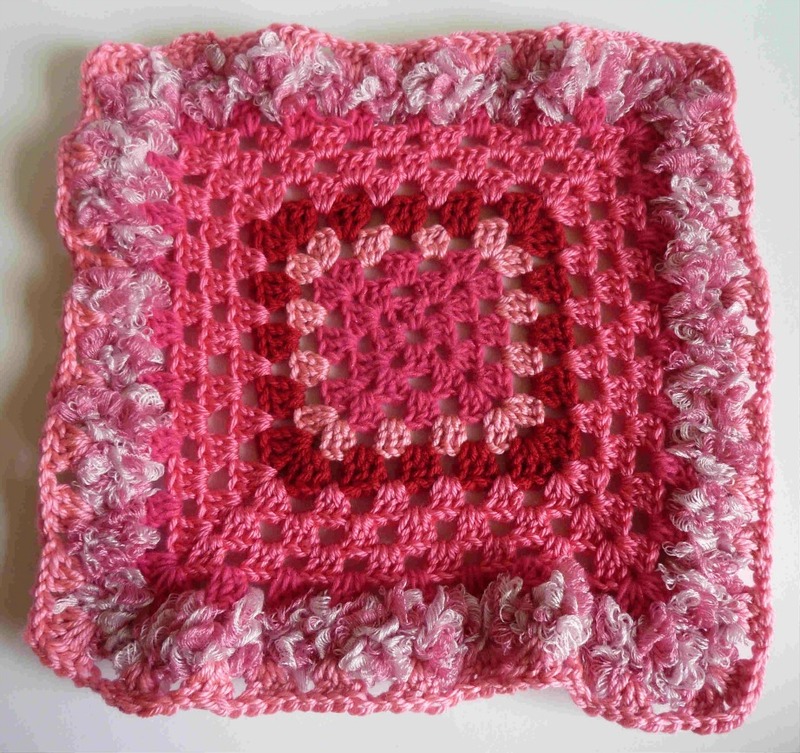 Uh, I'm sure this could be more elegantly written, but writing a granny square pattern is really damn hard. Okay, so check out this last 'square' with me. I got all fancy with a bulky ribbon row near the end. If you notice in the other squares, the bulky ribbon rows in the center don't really effect the square-ness of the squares like my experiment with an outer-edge ribbon row did. 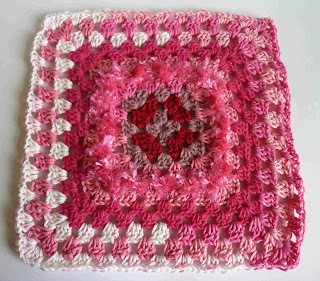 This is okay, it will get less ruffled and more 'in shape' as we add our edging on Thursday, and put it together with the other squares. No worries if the squares get wonky. The goal is to have fun and express ourselves artistically. It will all work out, I promise! can't wait to see how it will all come together. LOVE the sneak-peek squares! Yeah, I wanted to have it DONE so that I could show it today, but I just didn't finish in time. I was completely bummed out until I realized I could show it tomorrow (and just edit this post to put a picture of it in for future reference.) I'm sneaky like that! I'm so excited by how it's turning out. I think this project is going to be really special. You are a ROCK STAR! Love the colors/textures! I HAVE to make one! I just recently 'discovered' your blog & I am so appreciative of your generosity with the patterns. LOVE 'EM! 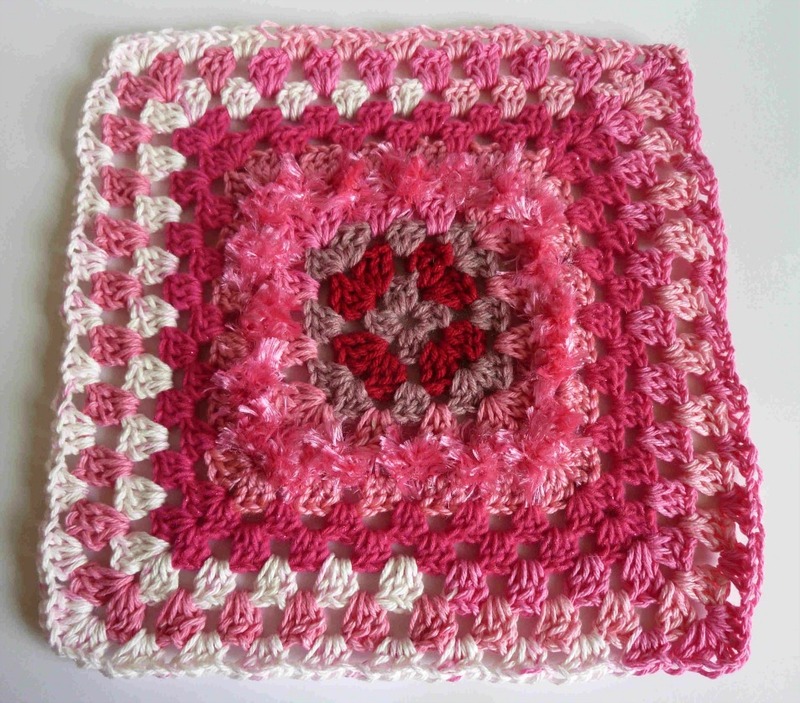 I've been crocheting for over 40 years & I love it! And it's FUN finding others who do! THANKS FOR BEING A SWEETHEART in Bloggyland! Hi Kai! I'm so happy to meet you!! Thank you for all of your very sweet comments. I think you're a ROCK STAR too! And good on you for putting in that "it's not a recipe!" disclaimer for us control freaks. Deep breath. I can be random. No, really, I can. Ahaha! You made me snort iced tea out of my nose! 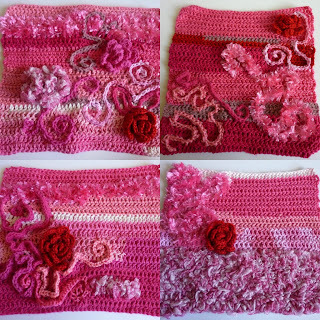 I just love all the textures and shades of pink, now I have to go raid my stash, take a quick trip to the store (LOL) and get started on my blanket. Thanks for the inspiration!! Hi Debbie! You're welcome!! I hope you have fun with it!! Hi Janie! Glad you found me again! Thanks for the kind words. I saw this design once before on AFC and it inspired me to make one in shades of purple. Mine is 20 large squares, each square uniquely designed, and covers a king bed. 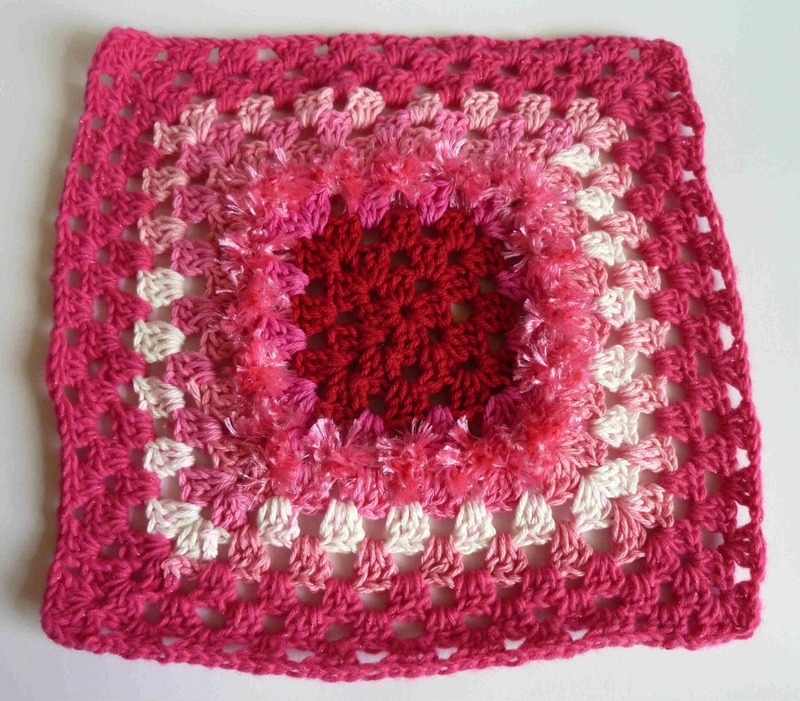 I crochet A LOT and am always looking for something new and inspiring. 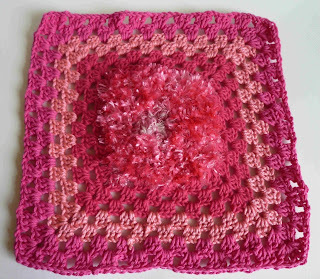 Jaime's marvelous creativity with the Think Pink Afghan did that for me. I love the results! Thank you, Jaime! I have never posted comments but just have to let you know this is amazing. It is a work of art to be treasured &I handed down for generations. It is beautiful & inspiring. 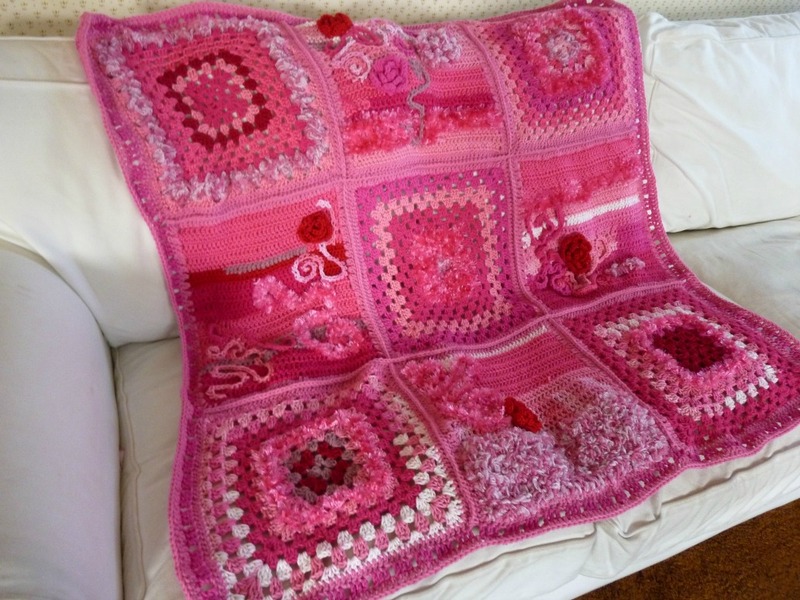 I have been crocheting for over 50 years &I this is the most creative &I beautiful piece I have ever seen. You are very generous to share your talent with us. I kept looking back at your page. I can't get enough of it. 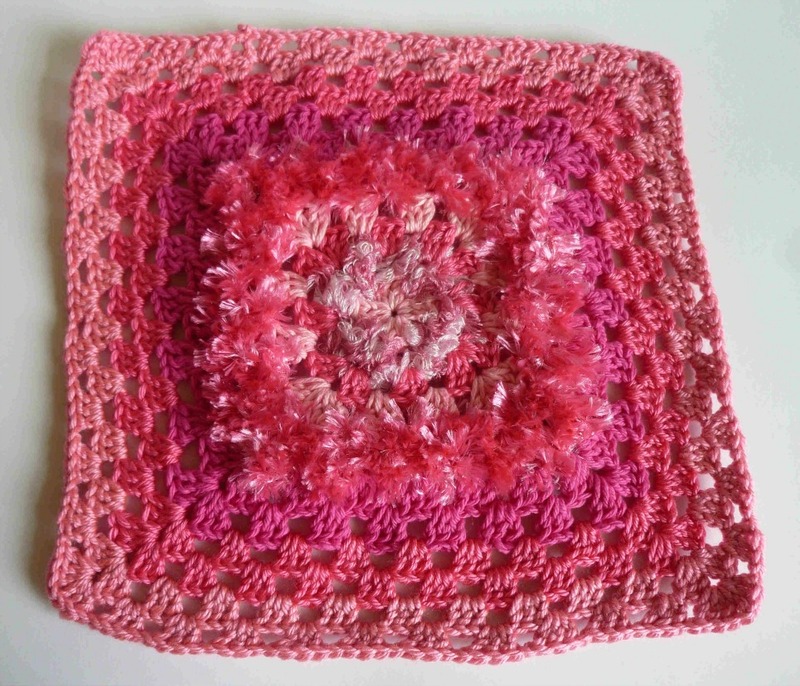 I love the colors and the textures of what you crochet. Nice!This is a perfect project for leftover yarn!